I won't bore you with the story of Purim (though it is a good one). 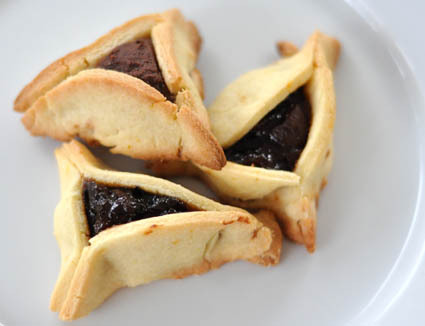 What's more relevant to this site are the holiday's traditional cookies, Hamantaschen. Sometimes they're huge and sometimes their small, but they are always shaped in triangles and typically filled with either jam or a poppy seed concoction not to my taste. I never made them before, but decided to give them a try this year. It was also an experiment in baking with my daughter (which is all the rage these days). She seemed to have fun helping me, except her attention span only lasted for about two cooking steps (the high point being anything involving filling measuring cups and emptying them). After that, she pretty much wanted to strip off her apron and get in a Cinderella dress. I hunted for recipes and settled on one from cookie authority Maida Heatter (see below for recipe) and made two batches: One with the filling in Heatter's recipe (a combination of apricots, prunes, walnuts, and honey) and another batch filled with Amy Scattergood's recipe for homemade Nutella. The homemade Nutella doesn't really resemble the real thing. But, that doesn't mean it it's not tasty. Made from ground, toasted hazelnuts, sugar, and cocoa, it's much more like a chocolate-enhanced nut butter as compared to a hazelnut-flavored chocolate spread (which is what Nutella tastes like to me). The fruit filing came together nicely. You cook dried apricots and prunes and walnuts together with a little water until it becomes thick and jammy. Then add the honey. Easy. The dough was another story. Mine turned out dry, crumbly, and barely sticking together. With just 1/4 cup of butter, one egg, and 1 1/2 tablespoons of orange juice, it didn't bind. (It seemed like the recipe should have called for more butter, eggs, juice, or something). But, I went ahead and wrapped it up it tightly in plastic wrap, hoping that after a night in the refrigerator, it would be fine. Stir for at least 10 minutes. It may seem like a long time but it’s necessary to completely coat the flour. Don’t be tempted to add more OJ as I have done over the years. It doesn’t really need more. Use a FORK to stir and when all the pieces of dough are coated, test it by squeezing a piece of dough between your fingers. Before you take the dough out of your bowl, make sure there are no dry pieces in the bottom, if there are, you didn’t mix long enough. Once all of the dough looks moist, it still won’t look like a ball of dough in the bowl but it will be ready. Turn the dough out onto a piece of wax paper and push the dough together using the wax paper, not your hands. It will come together beautifully, smooth and moist. It took me a long time to get it right so don’t feel bad if it wasn’t perfect on your first try. The first time I tried this recipe I thought that 1 ½ tbsp of OJ couldn’t possibly be enough liquid. Trust Maida, she was right. Lesson learned. Don't mix the dough in a food processor. Nevertheless, it did improve after chilling, though it was still pretty dry, crumbly, and now hard, to boot. Nevertheless, I was able roll it out in pieces, cut out rounds, and fill the cookies. The sides of the cookies tended to break as I turned them up to form the triangles. But, with some pinching here and there, they all came together. Despite my dough problems, the cookies came out perfectly fine (and even tasted better the next day). And there's also plenty of the fruit filling and homemade Nutella left over to keep enjoying even after the cookies disappear. Sift together, into a large mixing bowl, the flour, baking powder, salt, and sugar. Cut the butter into 1/2-inch slices, and with a pastry blender, cut it into the dry ingredients until the particles are fine and the mixture resembles coarse meal. Beat the egg lightly just to mix. Stir the egg, orange rind, and juice into the dough. Mix thoroughly and then stir well until the dough is completely moistened and smooth. Wrap in wax paper or plastic wrap, flatten the dough slightly, and refrigerate overnight. The filling may be made the next day or it may be made ahead of time and kept at room temperature for a day or two or refrigerated for a longer time. Cut the prunes and apricots into small pieces. Place them in a saucepan with the water. Bring to a boil, cover, and lower the heat so that they just simmer for 10 to 15 minutes until very soft. (Some fruits are drier than others -- if the water evaporates before the fruit is soft add another spoon or two of water and cook a bit longer.) Add the lemon juice and honey. Cook, stirring almost constantly, for about 5 minutes (it should not get too thick; it will thicken more while cooling). Stir in the nuts and set aside to cool. When you are ready to bake, adjust two racks to divide the oven into thirds and preheat to 400 deg. Cut aluminum foil to fit cookie sheets. Place the Hamantaschen 1 1/2 to 2 inches apart on the cut foil. Slide cookie sheets under the pieces of foil. Bake for 12 to 15 minutes until the cookies are barely colored on the sides, slightly darker on the edges. Reverse the sheets top to bottom and front to back to insure even browning. If you bake only one sheet at a time bake it high in the oven. With a wide metal spatula, transfer the Hamantaschen to racks to cool, or serve them warm. If anyone is in the kitchen with me when I bake these, very few if any actually have a chance to cool. The doughs with cream cheese in them are a lot better than the butter cookie methods like the one you've described. They end up much more flavorful and tender. We always have used a sugar cookie recipe that came out of some very old cookbook my mother had. It's pretty sticky, which is the good and the bad. (Plus, you get a sweet, tasty cookie, which doesn't always happen with hamentashen) Cream cheese base sounds interesting, though. Marcy Goldman's "Treasury of Jewish Holiday Baking" has my all-time favorite hamantaschen recipes in it. She gives three different dough recipes as well as simple recipes for prune, poppy, apricot and cherry fillings. I make a double batch every year, and they fly off my counter with astonishing speed. Ooh yum! I should have posted these in my hamantaschen roundup. This looks like an awesome recipe. I'm definitely going to try them out this year.